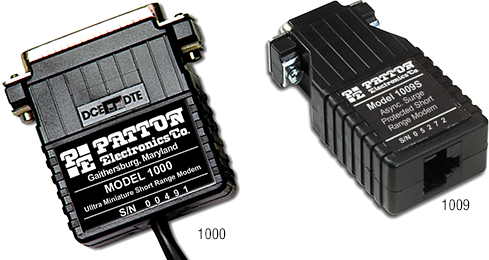 The Patton Model 1009 and 1000 supports asynchronous, point-to-point, RS-232, communication over two twisted pairs. The Model 1009 will plug into DB-9 and the Model 1000 plugs directly into a DB-25 interfaces. Both modems are backwards compatible with each other. This short haul is compatible with the Patton Model 1010.